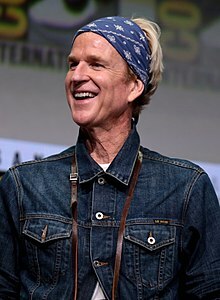 Matthew Avery Modine (born March 22, 1959) is an American movie, television, stage, and voice actor. His movie roles include Private Joker in Stanley Kubrick's Full Metal Jacket, the title character in Alan Parker's Birdy, high school wrestler Louden Swain in Vision Quest, football star turned spy Alec McCall in Funcky Monkey and the oversexed Sullivan Groff in Weeds. He appeared in Christopher Nolan's The Dark Knight Rises as Officer Peter Foley. Modine was born on March 22, 1959 in Loma Linda, California. He is the son of Dolores (née Warner), a bookkeeper, and Mark Alexander Modine, who managed a drive-in theater. He was educated at Brigham Young University. Modine is married to Caridad Rivera since 1980 and have 2 children. Wikimedia Commons has media related to Matthew Modine.